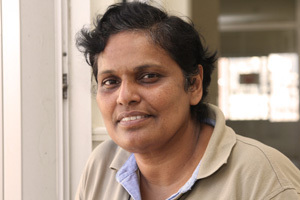 Nirmala juggles the roles of cook, cleaner, organiser, counsellor and head of the Caritas house where women who have been trafficked and who have escaped employer abuse come to seek safety. These migrant women are often referred to the safe house by the government, with whom Caritas works to support migrant workers to help them better understand and reclaim their rights – and to be in a safe, dignified place while doing so. However, Nirmala’s mission to help these women is deeply personal. When she was just 24-years-old, she moved to Lebanon as an economic migrant from Sri Lanka, leaving her family behind for the promise of a better life. Once in Lebanon, she got a job as a domestic worker for a family in Beirut. However, one day, while Nirmala was at work, she fell. She was in a five-story building but otherwise has no memories of the incident, nor does she remember if it was an accident. All she can recall is that she woke up in a hospital bed without any idea who she was. Beyond suffering memory loss, she broke her back in two places and was paralyzed for a time from the waist down. Many years have passed since that accident. And Nirmala now walks with a limp. But her energy and rigor have not allowed her injuries to define her. In the meantime, she was able to identify her family and learn the details of her past. Although she still doesn’t know the circumstances surrounding her fateful fall. Although it wasn’t a straightforward path, she eventually found her way to the safe house and to Caritas through volunteer work. After a string of domestic jobs, Nirmala found herself out of work without legal paperwork to remain in the country, or the financial means to travel back to Sri Lanka. While being hosted at the shelter, she felt the need to give back and began to volunteer. What started as a volunteer opportunity soon turned into a full time job as a counsellor, and eventually she rose to become the head of the shelter. For Nirmala, working with victims of human trafficking and employer abuse is rewarding and heartbreaking at the same time. She says she often takes in girls who show up with broken bones or psychological damage. “There are so many cases, it’s a huge, huge task,” she says. One particular case stands out. Nirmala remembers getting a call from a nearby hospital in the middle of the night about a girl with a broken back and broken arms. It turned out that the girl’s employer had crushed her arms with a hammer and locked her in a bathroom. To escape, the girl jumped off a first floor balcony. Yousra Taleb, senior project officer for Catholic Relief Services (CRS – a US member of the Caritas confederation) in Lebanon, works closely with Nirmala. She says that what makes Nirmala so effective is her ability to relate to the women she serves. Nirmala has no plans to quit or to go home to her native Sri Lanka any time soon. In fact she says she’s more committed now than ever to the cause of helping abuse victims survive.